Joachim Beuckelaer (c. 1533 – c. 1573/4) is a Flemish painter well known for specializing in depiction of markets, foods, and kitchen scenes. His elaborate displays of food and household equipment. His subjects often feature iconographical associations with Christian theology, but also very intricate depictions and representations of non-human dead subjects. Beuckelaer was also a student of Pieter Aertsen (c. 1507/8 – c. 1575) who also features very similar subject-matter. Him and his student Beuckelaer, both became very famous painter of everyday life. In one of his series of paintings called Four Elements: Water (1569), Beuckelaer depicts a scene of a market that represents twelve kinds of wish that are clearly dead and which ostensibly represent the twelve disciples of Jesus. Other Beuckelaer paintings such as the Slaughtered Pig (1563), is a quite realistic depiction of flesh in a pig’s cut open belly. 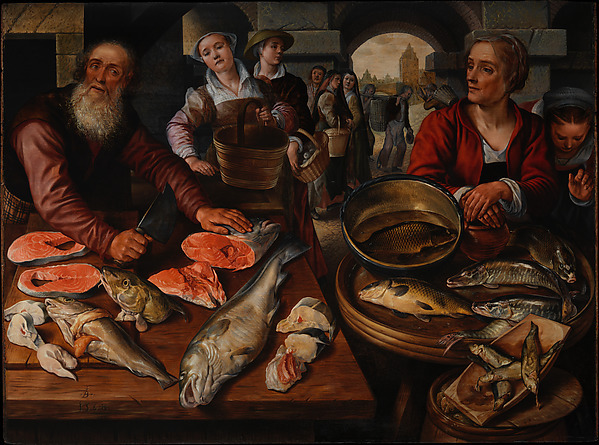 Joachim Beuckelaer’s Fish Market (1568), 128 × 174 cm. Located at The Metropolitan Museum of Art, New York. The painting itself features a very detailed depiction of dead fish as the subject-matter, as well as a bounty from land and sea that was becoming available to the developing local markets. As Hegel states that “by mere imitation, art cannot stand in competition with nature”5, for when the “principle of imitation is purely formal, objective beauty itself disappears when this principle is made the end of art”.6 If such becomes the aim of art, then the correctness of the imitation is the sole question that remains, and not what is supposed to be imitated. The Fish Market should therefore be examined not just as a mere imitation of a market scene; a sensuous apprehension which Hegel describes as “the poorest mode of apprehension, the least adequate to spirit”,7 nor should it be examined according to the subject-matter’s “purely theoretical relation to intelligence”,8 but the examination shall occur according to Hegel’s science of art; the middle between sensuous interpretation and ideal thought.9 In this manner the sensuous is liberated from its “material scaffolding”.